The number of options and formats that can be used to modify and customize PromoSimple entry forms are limitless, so we’re trying to share a few tips and hacks that can be used to further customize your next giveaway. 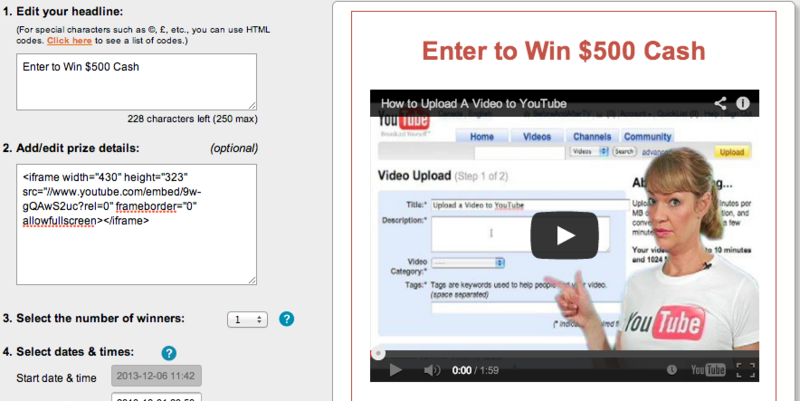 Want to add a video to your giveaway’s entry form? It’s easy to do with steps below. If you’d like to display the video immediately when the entry form loads you can add it within the description area of your entry form. Just paste your video’s iFrame code into the description section. To get the code for a video from YouTube (please be sure that you have the rights to use and embed this video) just click on the Embed link under the video. You can then set the video’s iFrame to a width of 430 pixels (this will automatically set the height to 323 pixels). You can then copy the iFrame’s embed code to place in your Description area. Add YouTube subscribe buttons as entry methods in your giveaway.